LeAnne Gompf | Morrow County Sentinel Pictured are members of the Cardington High School Class of 1950 who attended the Cardington-Lincoln HIgh School Alumni party to celebrate their 65th anniversary. Back row: L-r: Harriet Shoults Gompf, Ruth Smith Farmer and Evelyn Fricke Long. Seated are Nadene Coykendall Underwood, left, and Clarence Walter. 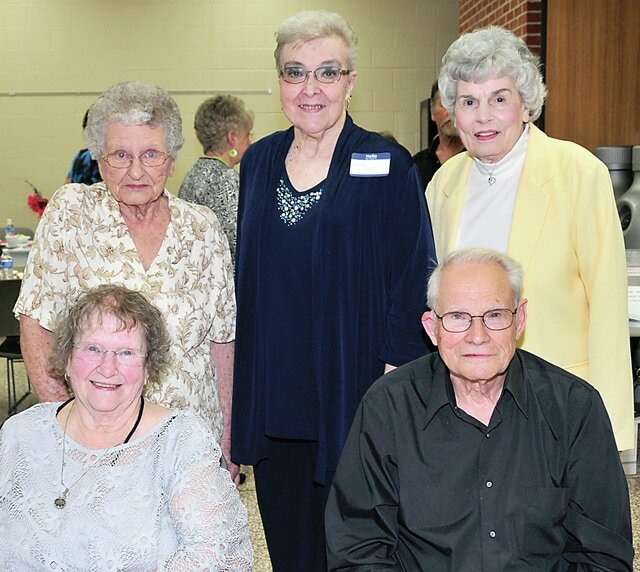 Five members of the Cardington High School Class of 1950 attended the Cardington-Lincoln HIgh School Alumni party to celebrate the 65th anniversary of their graduation. Ironically, their graduation date was the same date as the alumni party – May 23 – 1950. The class graduated with 43 members. There are 23 deceased. Sending their best wishes but unable to attend were Bruce Gantz, El Cajon,California; Gene Stockdale, Heiskell, TN; Joan Richeson, Holly Hill, Florida; Bob Martin, Caledonia; Kathryn Sachs, Tipp City, Ohio and Ken Ackerman, Marilyn Edgell, and Jack Wilhelm, Cardington. Those attending were all from Cardington with the exception of Clarence Walter, Mansfield and Ruth Farmer, Delaware.